Nearly 5 years have passed since our last show at Kunstverein. 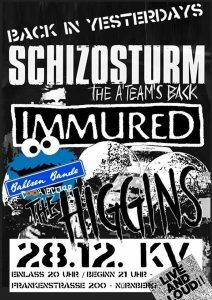 We are looking forward to playing with Schizosturm and The Higgins at the end of December. 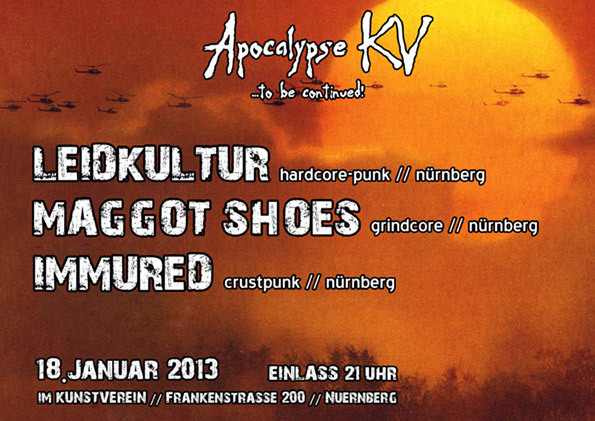 We’re pleased to play with some of Nuremberg’s finest next Friday. Will be one of the very last shows at Kunstverein, as it’s closed for renovation for approx. two (!) years! So be there and enjoy! 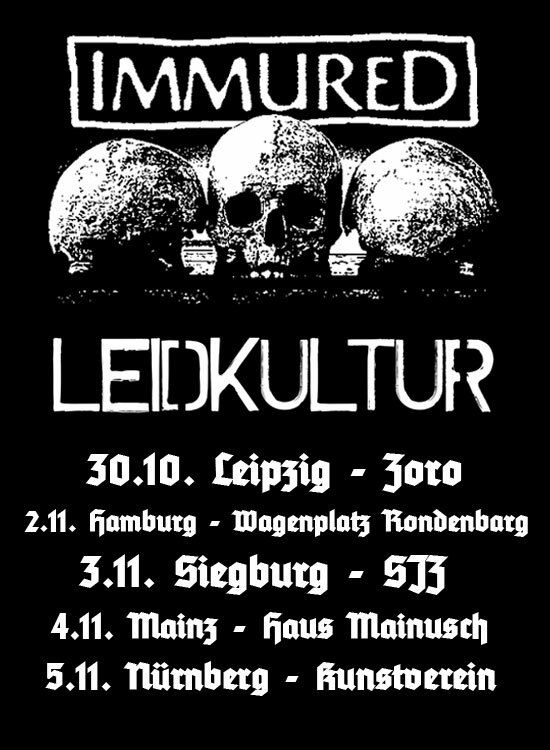 10.11.12 Regensburg (D) – L.E.D.E.R.E.R. Back from tour, we had a hell of a time (literally when I think of the temperatures in the bus)! Many thanks to all the nice guys we meet, that booked us shows, gave us food and drinks and let us crush on their floors! There are a couple of videos uploaded, including three new Songs, namely „German Beast“, „100 Days“ and „Graves Grow Here“. Enjoy! Photos will follow, and merchandise leftovers will be on the site soon, too! Hello again! It’s really been some time since the last post, and yes, we’re still active! Thanx for the few who asked. New as for the line-up: Keks had to left IMMURED this Spring, mainly for seasonal reasons. Ronny aka Nase is the new guitar player, welcome on board! 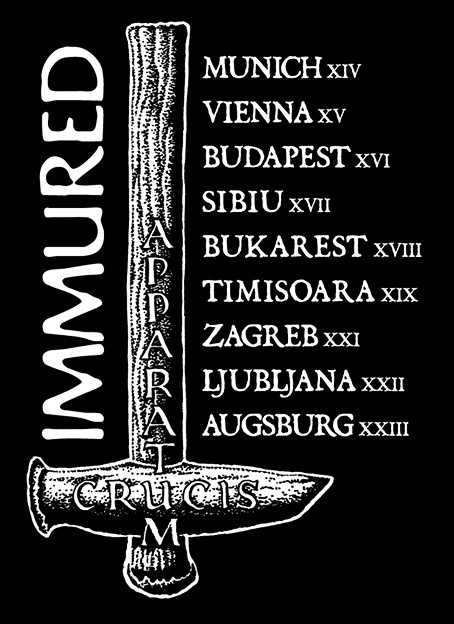 Hitting the road with Leidkultur, check the dates section for further info! Here are the dates, hope to see you there! 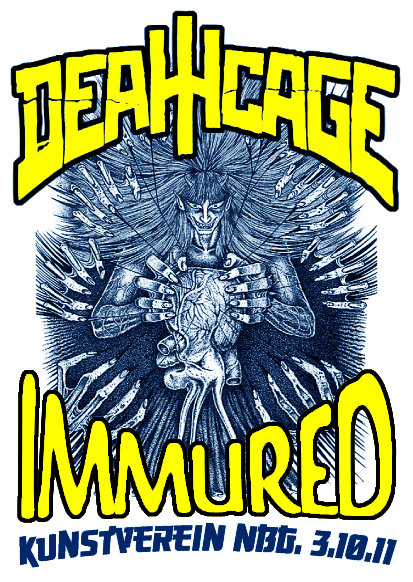 Also we’re glad to play with some of Nuremberg’s finest in Schweinfurt this Friday. Check the show section for details. May 2010 will see a small tour around Western and Northern Germany, get in touch if you can help setting up shows for us (especially in Northern Germany).